So today is April Fool's Day and we are destined for a bunch of silliness. 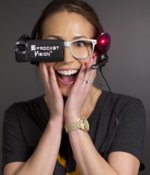 Courtesy of HubSpot comes SprocketVision, a "revolutionary new product that will change marketing forever." What could possibly change marketing forever? SprocketVision, of course! SprocketVision is a pair of high tech glasses that help you find qualified leads for your business just by wearing them and walking around. With "real-time inbound marketing" SprocketVision guides the user through the process of qualifying a lead in the real world. HubSpot's Director of Product Management Christopher O'Donnell sums up the offering best saying, "Our technology for detecting the most qualified prospects in your field of vision is nearly perfect...minus a few kinks we're still trying to work out." If you think SprocketVision will help you generate leads, head over to HubSpot's HubShop and buy a pair...or at least try to...the glasses are on backorder until 2020. Or you can tweet using hashtag SprocketVision what you would do with the glasses if HubSpot gave them to you.